As Baltasar’s journey takes him into uncharted lands on Columbus’s voyage westward, he learns that stories are more powerful than he once believed them to be—and much more dangerous. Shana Mlawski’s magical debut novel takes a fresh look at one of the pivotal moments in human history. 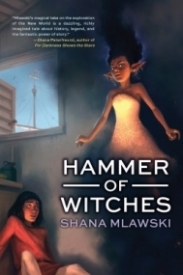 With Hammer of Witches, Shana Mlawski has spun a gorgeous historical fantasy that will be sure to captivate readers. By the end of the first chapter, I was completely hooked and continued on to read straight through the book. Hammer of Witches takes my two favorite genres - historical fiction and fantasy - and blends them together, which is even more awesome in my book. It was the perfect vehicle for the story Shana Mlawski had to tell! The idea of magic in Shana Mlawski's book is so neat - magic is not just magic, and she has given such power to what is generally just a regular old storyteller. I love the idea of there being magic in stories, since as a child, I was always so fascinated by them. The very real personification of that in Hammer of Witches was excellent. Witches or sorcerers are called Storytellers in Shana Mlawski's world. The setting is refreshing and new - Spain during the Inquisition, followed by taking Christopher Columbus's path West is not a well traveled path in the world of fantasy, so it was exciting to see a new place through the eyes of a talented story teller. Balthazar is a delightful main character - he was so inquisitive and worked together well with Jinnijah, the story's other main character. And together they encounter such a wide cast of characters and a slew of different creatures. Hammer of Witches is a coming of age journey and a stunning debut. Books like this one just confirm why I love middle grade so much - it was delightful, fun, and tells a really great story!